Trains are the best means of transport for coming to the Cinque Terre on vacation. • From MILANO (MILAN) take Autostrada (freeway/motorway) A7 till Genova, then A12 to Livorno and exit at Carrodano-Levanto. From Milano to Monterosso it takes 3 hours. • From VENEZIA (VENICE) take Autostrada A4 till Padova, then A13 till Bologna, then A1 till Parma, A15 to La Spezia, then A12 to Genova and exit at Carrodano-Levanto. Alternatively take A4 to Milano, then see from Milano. It takes 6 hours. • From FIRENZE (FLORENCE) take Autostrada A11 to Viareggio or the toll free superstrada for Pisa (blue signs for Pisa) and then take Autostrada A12 till Genova and exit at Carrodano-Levanto. It takes 2 ½ hours. • From SIENA take the superstrada to Firenze (blue signs for Firenze). From Firenze take Autostrada A11 to Viareggio or the toll free superstrada for Pisa (blue signs for Pisa) and then take Autostrada A12 till Genova and exit at Carrodano-Levanto. It takes 3 hours. • From ROMA (ROME) take autostrada A1 to Firenze, then see from Firenze. It takes 5 hours. • From PARMA take A15 to La Spezia, then A12 to Genova and exit at Carrodano-Levanto (second exit after La Spezia). • From NICE (France) take Autostrada/Autoroute to Ventimiglia (italian border) and then to Genova. In Genova, take A12 to Livorno and exit at Carrodano-Levanto. From Nice to Monterosso it takes 5 hours. Take the A12 Genoa-Livorno highway and exit at CARRODANO-LEVANTO. Follow the signs for Levanto and Monterosso. After you pass Levanto, the road will lead uphill; at the top, there will be a short tunnel, and then, after 400 meters, do NOT take the road on your left marked La Spezia-Pignone-Vernazza. Rather, continue straight on and after a few meters, at the JUNCTION, go left towards Monterosso-Fegina. After about 5 kilometres you will reach the town. The paid parking area will be right in front of you. From there, you must continue on foot or by taxi to the hotel, which is about 800 meters away. If you would like to book one or more spaces in our car park (extra charge), call 0187.817477 or 0187.817550. • Genoa 1h. 15 min. • Florence 2h. 30 min. • Pisa 1h. 30 min. • Rome 5h. • Venice 5h. 30 min. From Monterosso railway station: on exiting the railway station turn left along the sea front. 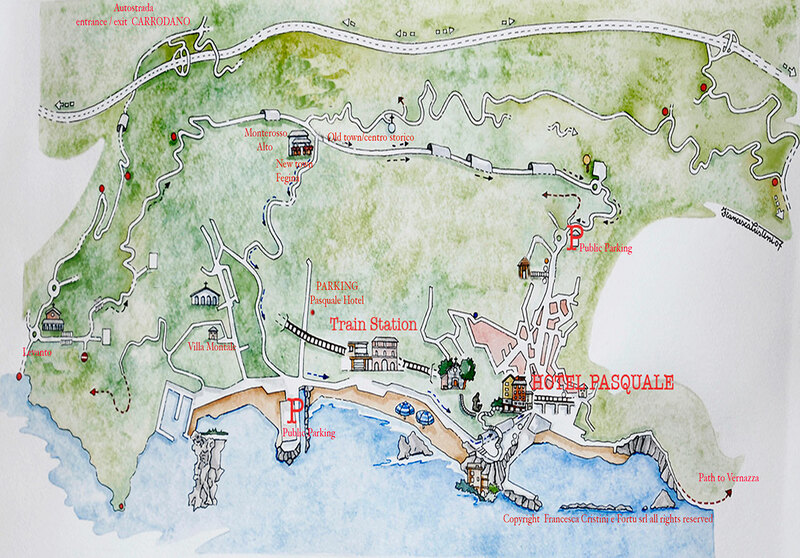 After 300 meters pass throught a short tunnel Hotel Pasquale is on your left side after the tunnel. • Genoa 1h. 15 min. • Florence 3h.